The Thunder made big changes to their rotation in Game 2 and found success, but they'll have to make further alterations to sustain it in Game 3. 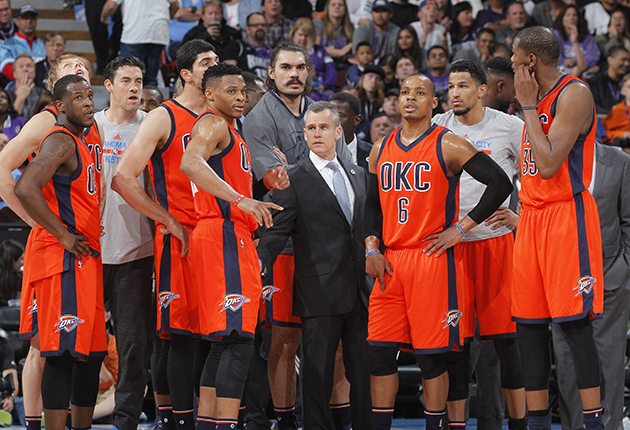 OKLAHOMA CITY — The opening game of a playoff series is a test of viability. Each coaching staff has an idea of the players they’d like to play and the strategies they’d prefer to employ. Only some will actually work. From there begins a gradual refinement; the art of the adjustment involves zeroing in on what a team does best and leaving much of the rest by the wayside, no matter the good it served during a long regular season or some playoff series past. There’s no room to be precious when a coach must be precise. All of this is relatively new to Thunder head coach Billy Donovan, who has plenty of experience with postseason pressure but little with the dynamics of a postseason series. The NCAA tournament is a different beast. Its format leaves no opportunity for strategic clarification because one game decides all. Were that the case in this series, Oklahoma City would have been erased from the playoffs with a Game 1 blowout. Instead, Donovan was able to tinker with his rotation for the game that followed to alter its staging. any shot he wanted from the lane. That won’t do. Durant assumed some of Collison’s minutes in Game 2, albeit with ghastly results. The idea of Durant as a power forward is spectacular. The reality of it is soured when those minutes come alongside Kanter, Cameron Payne, Anthony Morrow, and Dion Waiters. That lineup was outscored by an astounding 17 points in six total minutes of action, during which the Thunder shot 1-of-9 from the field and bled out defensively. One late-game stretch, in particular, nearly cost Oklahoma City the game. The lineup Donovan trotted out would have failed no matter who was playing power forward. Some adjustment elsewhere in the rotation should be able to fix the problem; by altering substitution patterns slightly, the Thunder should be able to field a more balanced (and thus more competitive) small-ball unit to help buy time for the bigs to rest. It’s natural for Ibaka and Adams to be tired; the former was bludgeoned throughout Game 2 by LaMarcus Aldridge and the latter played particularly engaged defense against San Antonio’s layered play action. The problem, more generally, is that both Ibaka and Adams would end their first stint of each half together—thereby aligning their minutes on the floor. Staggering their exits would minimize the minutes in which a frontcourt of Durant and Kanter would be expected to slow one of the best offensive teams in the league. A slice of Collison’s minutes also went to Adams, enabling the seldom-used jumbo pairing of Adams and Kanter. Those two only played 127 minutes together all season, yet in the early fourth quarter Donovan entrusted them to hold their own against San Antonio’s reserve bigs. They succeeded—perhaps in a way that could last a few minutes at a time throughout the series. Within that same lineup was another adjustment: Waiters, whose ability is so often shorted by his decision-making, was left in the game to run point. Oklahoma City got away with playing Randy Foye as its backup point guard in its first-round series against Dallas, yet Donovan found out rather quickly that the out-of-position veteran wouldn’t be a realistic option against San Antonio. Foye didn’t see a single minute of action in Game 2. Yet Payne, whom Donovan had tabbed as the natural point guard alternative, was also flustered by San Antonio’s defense in the ways you’d expect a rookie point guard on the fringes of the rotation might be. Talent alone won’t cut it. Payne simply doesn’t have the practical experience to run an offense under this level of scrutiny, particularly when he wasn’t given much opportunity to scale up with minutes against the much more accommodating defense Oklahoma City encountered in the first round. It was worth a try to throw Payne into the fire to see what he might offer, but the Thunder were outscored by 17 points in his seven minutes in Game 2—during which he missed all three of his shot attempts and turned the ball over once. The thought of Waiters initiating offense on a regular basis is far from comforting, particularly if Payne’s minutes are whittled down further. Waiters has his merits; relative to the other backup options at the position, Waiters is the best on-ball defender, the strongest driver, and perhaps the best shooter. His play also lacks a certain recognition that can lead to minutes-long downward spirals, the likes of which the Thunder can hardly afford. It seems inevitable that Westbrook will have to play more and more minutes as the series progresses (he logged 37 in Game 2), even at the expense of his on-court energy. , however, and Waiters can at least hold his own. If he can offer reasonable resistance against Leonard and contribute anything positive offensively, he’ll remain the Thunder’s best closing option at shooting guard. Should he falter in any way, Oklahoma City lies exposed. On top of that: The realities of the point guard rotation may demand his involvement; small-ball lineups will need his wing minutes; and every minute that Roberson or Morrow play is a danger to the offense and defense, respectively. Game-to-game adjustment can only go so far before making a volatile contributor like Waiters the rotation’s pressure point.